For many people, traveling through Australia means doing the backpacker circuit on the East Coast, usually starting in either Melbourne or Sydney and going up through to Cairns with maybe a trip to the Outback as part of the trip. Nine years ago, I did just that. In doing this, you take in three major highlights along the Queensland coast: Fraser Island, The Great Barrier Reef and the Whitsundays. For us, the East Coast was actually a bit of an afterthought in our planning of Australia: we'd really focused on getting a chance to reconnect with my friends in Melbourne and Sydney as well as have the opportunity to really embrace the middle, both the red (Outback) and green (Darwin and Kakadu) parts. In fact, our East Coast portion of the trip was going to have the least amount of time out of all the areas we were to visit. As a result, we had to make some decisions. In short, goodbye Whitsundays (too expensive and too far up the coast) a brief visit to Fraser Island and a proper day trip out to the reef. First stop was the town of Hervey Bay, the launching point for Fraser Island. Most budget travelers do the self-guided tour where between 7-9 backpackers get thrown together, are given a 4wd and a map and let loose on the Island for three days. Due to a number of factors, we elected to bypass that option and do the more touristy but far less stressful one day trip to the island. It would still allow us to see the highlights and not worry about having someone else's driving send a major dent into our credit card. We set off for the Island with our tour guide Sally and 38 of our closest friends in a styling 4wd bus. Fraser Island (click on the link for lots more info on the island) is the world's largest sand island, stretching 123km north to south and averaging 15km wide. It's also listed as a world heritage location for both the geological history of the island (the vegetation and the ongoing changes associated with the sand) as well as for the numerous lake systems that are plentiful on Fraser. I'd remembered Lake McKenzie from my previous visit to Fraser; the white sand beaches and crystal blue waters are hard to forget. On this day though the water was a bit more green-grey due to the clouds and occasional drizzle. Sadly enough it was the nicest weather we'd have all day. As you can see though, the crystal clear beauty of the lakes even make our travel worn feet look good. Becca braved the elements to wade in. Once that didn't prove too painful she elected to keep herself dry (and warm) on top with shirt and raincoat but enjoy the lake on bottom with bathing suit. Last time I saw she was headed out across the lake. The rest of the day was as good as it could be given the conditions. It POURED buckets the rest of the day and despite that we pretty dry (when we weren't walking in and out of the water, wading down Eli Creek, etc.). We enjoyed driving down the main 'highway' on the island: Seventy-Five Mile beach and we even got to see one of the famous Fraser Island dingos. Our pit stops at Pile Valley (putting the rain in rain forest), the Coloured Sands, Maheno Wreck and Eli Creek (where walking down the creek was warmer than being on land) were great viewing though tempered by the conditions. We had dinner that night with our friend Thorsten aka The Merc and shared our travel adventures post Outback. He was headed back to Melbourne pretty much straightaway, leading to the health concerns and mental sanity issues that arise when being on the bus for something like 30-40 hours. During our dinner though, he offered to let us borrow his swank mask and snorkel for our trip to the reef. This ended up being a huge gift that we were quite thankful for down the road. Our next stop were the tiny towns of Agnes Waters and 1770, our launching point to Lady Musgrave Island and the Great Barrier Reef. We had chose this location due to the fact that it was off the major tourist track and gave us a chance to see the reef in a closer in location. 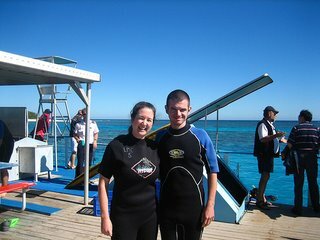 As with most of our trips in Australia, it involved another tour (because really are YOU going to rent your own boat, snorkel equipment, etc.?) but one that had us confident that we'd get a good experience. Our boat ride out was a bit... dodgy. The captain had promised a smooth ride out to the snorkel site but instead we got a two hour ride that was very choppy at best. We had double digit people using their barf bags downstairs (the Chinese tour group being the majority of the victims) and Becca and I wishing we hadn't had our muesli bars and yogurt for breakfast. We got out to the tour's designated pontoon and over the next five hours did a few different stints in the water snorkeling amongst the reef, took in a tasty lunch (including another shot at prawn sandwiches), did a 30 minute tour of the island itself (named after the wife of the Queensland governor whose claim to immortality was that she gave good tea parties for politicians at the capital) and just generally soaked in the beautiful surroundings and views. The one disappointment was the reef itself. From the locations where we snorkeled, the reef looked a bit... tired. There's no other good way to describe it. We'll have pictures up from here and Fiji when we get back to the States but it just lacked some of the striking colors you expect from the famous Barrier reef. In talking to people though it sounds like part of that may be due to our decision to snorkel; evidently the sharp colors are in the outer reef where only the divers go. For me that was just fine; I'm not the strongest swimmer in the best of times but thanks to Thorsten's nice equipment I had one less thing to worry about as I floated along the water trying my best to a) enjoy the scenery and b) convince myself that having my head face down in the water was ok. (Since Becca was more comfortable in the water she got to deal with the leaky rental masks and snorkel.) Again, I'm no Ian Thorpe. And putting me in a diving suit is going to happen about the same time I convince my brother to run a marathon.